Restrepo is a 2010 American documentary film about the Afghanistan war, directed by American journalist Sebastian Junger and British photojournalist Tim Hetherington. The film explores the year that Junger and Hetherington spent in Afghanistan on assignment for Vanity Fair, embedded with the Second Platoon, B Company, 2nd Battalion, 503rd Infantry Regiment, 173rd Airborne Brigade Combat Team of the U.S. Army in the Korangal Valley. The 2nd Platoon is depicted defending the outpost (OP) named after a platoon medic who was killed earlier in the campaign, PFC Juan Sebastián Restrepo, a Colombian-born naturalized U.S. citizen. The film begins with background that reads: "In May 2007, the men of Second Platoon, Battle Company began a 15-month deployment in the Korengal Valley of eastern Afghanistan. It was considered one of the most dangerous postings in the U.S. Military." The soldiers are ferried in by Chinook and begin their deployment at Combat Outpost (OP) Korengal, or "KOP", and early in the campaign PFC Juan S. Restrepo is killed, as well as another team member, PFC Vimoto. The film portrays negotiations with the local people, construction of an advanced outpost called "OP Restrepo", as well as the challenges and intermittent fire-fights they face. In the latter part of the film, the dangerous mission Operation Rock Avalanche is shown along with some of its tragic consequences. One event was the loss to Battle Company of Army Sgt. Larry Rougle. It was there, in 2007, when Army Sgt. Rougle, who served two tours in Iraq and three in Afghanistan, was ambushed by a large number of Taliban. It was learned that Rougle, at point, took the brunt of the attack, allowing his soldiers to secure a position and fight. Army Sgt. Larry Rougle, who is a recipient of the Purple Heart, is buried in Arlington National Cemetery. Restrepo is a film not just about the events of combat, but also about "brotherhood," according to Junger. The film shows the dedication to their duty as a soldier and their commitment to one another as brothers. The film is narrated by several men who fought with PFC Juan S. Restrepo. The men discuss loss such as dead civilians and soldiers, as well as the emotional distress that the soldiers are left with in its aftermath. The film ends with a coda that reads: "In April 2010, the United States Army withdrew from the Korengal Valley. Nearly 50 American soldiers died fighting there." For his actions during the operation, Staff Sergeant Salvatore Giunta, who is not featured in the film, would later become the first living person to receive the Medal of Honor since the Vietnam War. From the same battalion, Sergeant Kyle J. White would also later receive the Medal of Honor. 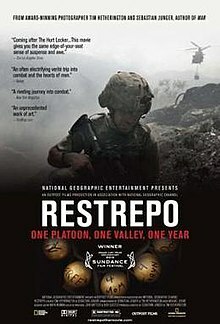 Restrepo received the Grand Jury Prize for best documentary at the 2010 Sundance Film Festival. The film received a certified fresh rating of 96% on Rotten Tomatoes; the consensus states: "Forsaking narrative structure for pure visceral power, Restrepo plunges viewers into the experiences of soldiers on the front lines of the Afghan War." Roger Ebert awarded Restrepo four out of four stars. Additionally, numerous critics and publications included it in their annual top film selections. It was named as one of the top documentary films of 2010 by the National Board of Review. It was nominated for the 2010 Academy Award for Best Documentary, losing to Inside Job. In March 2014, Realscreen magazine revealed that Junger was working on a sequel to Restrepo, titled Korengal. The film was released in theaters in New York on May 30, 2014, with a pay-VOD release following in September 2014. The sequel "departs from the vérité style of the original somewhat, as it features an original score and some archival news footage". ^ "Restrepo – Theatrical Release". International Documentary Association. Retrieved December 1, 2010. ^ "Restrepo (15)". British Board of Film Classification. September 20, 2010. Retrieved May 9, 2014. ^ "Restrepo (2010)". Box Office Mojo. Retrieved December 1, 2010. ^ Into the Valley of Death, Sebastian Junger, Vanity Fair, January 2008 article, discusses the strategic value of the Korangal Valley. ^ An up-close yet impersonal look at war, Wesley Morris, Boston Globe movie review. ^ Rubin, Elizabeth (February 24, 2008). "Afghanistan - Korengal Valley - United State Military - Counterinsurgency". The New York Times. ISSN 0362-4331. Retrieved August 26, 2016. ^ Patterson, Michael Robert. "Larry Ismael Rougle, Staff Sergeant, United States Army". www.arlingtoncemetery.net. Retrieved August 26, 2016. ^ "President Obama Presents the Medal of Honor to Staff Sergeant Salvatore Giunta: "We're All in Your Debt"". whitehouse.gov. Retrieved January 11, 2016. ^ Hetherington, Tim (November 11, 2010). "Medal of Honor Winner Salvatore Giunta on Bravery, Brotherhood, and the Korengal". Vanity Fair. Retrieved November 7, 2013. ^ Addicott, Brooks (January 30, 2010). "2010 Sundance Film Festival Announces Awards". Sundance Institute. Retrieved November 30, 2010. ^ "Restrepo". Rotten Tomatoes. Retrieved May 9, 2014. ^ Restrepo review, Roger Ebert, Chicago Sun-Times. ^ David Denby (December 7, 2010). "The Best (and Worst) Films of the Year". The New Yorker. Retrieved January 11, 2016. ^ "2010 in review: Betsy Sharkey on film". Los Angeles Times. ^ a b Benzine, Adam (March 31, 2014). "Exclusive: Junger, Goldcrest to self-release 'Restrepo' sequel". Realscreen. Retrieved April 1, 2014.